Cheese fondue might be known as a Swiss creation—after all, it is the country's national dish—but Fondue Savoyarde hails from the French Alps region of Savoie. In its traditional sense, "fondue" refers specifically to dipping food into melted cheese, though it's come to be colloquialized as any dish in which a food is dipped into a pot of hot liquid. Fondue Savoyarde sticks to the traditional definition and uses French cheeses, such as Comté, Beaufort, Reblochon, or Abondance. Before you dip in, know of a local tradition: If your piece of bread slips off your fork into the cheese, you're on the hook for the next round of drinks. Fondue Savoyarde is one of the most famous dishes to come from the Savoie region, which lies at the heart of the French Alps and is home to many of France's most fashionable ski resorts. The food here is rich and hearty—perfect for capping off a day on the slopes. Savoie tradition says that if your bread cube slips off the fork into this rich, cheesy fondue, you must buy the next drink. The secret to the perfect fondue is to use high-quality grated cheese for melting. For the bread, choose artisan bread, such as a good-quality sourdough. The chewier the bread, the better it will hold the melted cheese more successfully than a cheaper baguette. Rub the inside of a saucepan with the cut side of the garlic, doing so thoroughly to transfer the flavor of the garlic on to the pan. Discard the garlic. In a small bowl, whisk together the wine and cornstarch. Add it to the saucepan and bring it to a gentle, rolling boil. Reduce the heat, so that the wine is just simmering. Add the cheeses, followed by the nutmeg, black pepper, and paprika. Using a wooden spoon, stir constantly until the fondue is melted and smooth. If you find the cheese is sticking, lower the heat. Keeping the heat low to medium, continue cooking — never boiling — the fondue for 15 minutes until it has thickened. Once thickened, add the Kirsch, stir, and cook for 1 minute longer. Transfer the fondue by pouring into a fondue pot set over a flame. 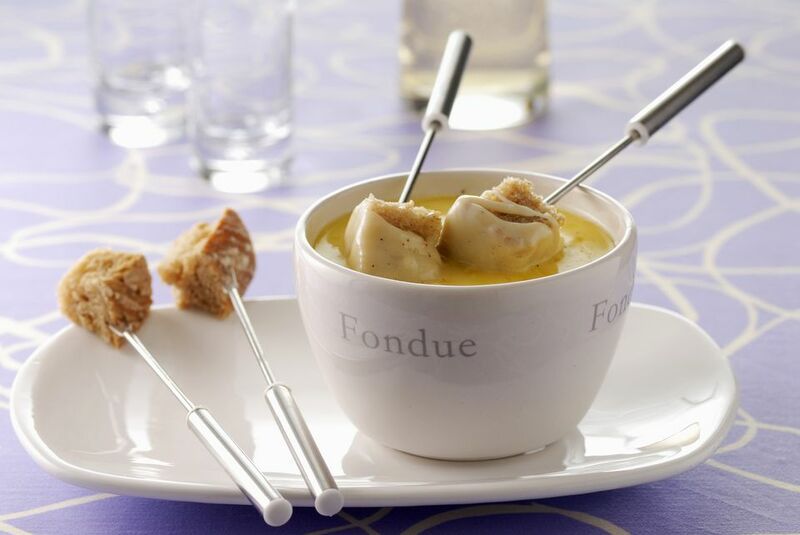 Provide each guest with a long fork and serve your hot, thick fondue with the cubed bread. If the fondue gets too thick, particularly after it's been sitting for a while, add a few tablespoons of white wine and stir to thin out the mixture. The alcohol in the fondue is key to lower the boiling point of the cheese, so the proteins don't curdle. Take care not to heat the mixture too high and reach the boiling point. If you don't want to use alcohol, use high-quality chicken broth in its place and keep the heat low. Swiss fondue: Replace the French cheeses in the fondue with Swiss options, such as Gruyère and Emmentaler. Southwestern fondue: Replace the cheeses with Monterey Jack and Oaxaca cheese. Add a can of diced green chilies and one link of crumbled chorizo.